How high should the nestbox be from the ground? Where can I get a good nestbox, and how much will it cost? Where can I obtain a mounting post, and how much will that cost? Why can’t I put my nestbox on a tree or a wooden fence post? What is a predator baffle, and do I really need one? Can I make my own nestbox? Where should the nestbox be located? What kind of nestbox should I put up? Nestboxes should preferably be made of unpainted cedar, pine or redwood. If you must paint your nestbox, it should be painted ONLY on the outside, in a very light color, to avoid overheating. The box should have an overhanging slanted roof, NO perch, and a round entrance hole 1 1/2 to 1 9/16 in diameter. It should have ventilation and drainage holes, be deep enough so predators can’t reach in to get the eggs, and have a door that opens for ease of monitoring and cleaning. In areas of intense summer heat, additional measures should be taken to avoid overheating, such the use of 3/4” lumber, an overhanging roof on all sides, and placement in a location that receives shade from the afternoon sun. Examples of different types of nestboxes. Thanks to Arlene Ripley for these sketches. How high should the nestbox be from the ground? At eye level when you open the box would be ideal for monitoring. The experts say around 5-6 feet from the ground is best. Where can I get a good nestbox, and how much will it cost? Not all bird houses with a label that says “Bluebird House” are really suitable for Bluebirds! 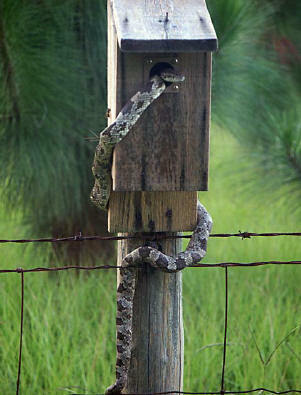 Nestboxes sold at home improvement or department stores may state that they are Bluebird Houses, but frequently they have no drainage or ventilation, the entrance holes may or may not be of the correct size and the box dimensions may or may not be proper. Any good bird supply house will sell a suitable Bluebird nestbox. Stores such as Wild Birds Unlimited sell Bluebird nestboxes You may be able to find a suitable nestbox at a “home improvement” store, but be certain that it fits all the specs necessary for a NABS-approved nestbox. The cost of an approved Bluebird house will vary from about $25 to $50, depending on whether you want a basic house or one that has extra features. It is always a good idea to measure the entrance hole even before you buy, because even an approved box could have an incorrect entrance hole (by mistake) If the entrance hole has several rough edges, they can be sanded down to make it easier for the blues to get in and out. Where can I obtain a mounting post, and how much will that cost? Wild Birds unlimited (WBU) frequently also sells mounting poles called Bluebird house poles so the height is correct. They will also do the mounting hardware for you in the store. They also sell ground anchors for the poles, which cost about $10 for the heavy duty one and will keep that house standing straight, even in strong winds. Mounting posts may also be made from galvanized pipe obtained at a home improvement store. Why can’t I put my nestbox on a tree or a wooden fence post? A natural cavity in a tree is not as obvious a target to a predator as a wooden box. It sticks out like a sore thumb. Predators are very clever. If they have found a meal in one wooden box, they learn to look for more, and if your nestbox is on a tree or fence post that a predator can climb, you will have placed your Bluebirds in more danger than if you had never offered them a nestbox at all. Can I make my own nestbox, mounting post and baffle?Certainly, if you are handy, you can save quite a bit of money on your entire setup by making your own. NABS Nestbox Plans and specifications for building, mounting and placement. Where should the nestbox be located? The box should be at LEAST 50 feet from nearby bushes and trees, 200 feet if house wrens are a problem. It should not be located close to feeders used to attract other backyard birds. It must be far enough away from a tree, fence, etc. that a predator could not jump to or onto the house. The predator baffle will keep a predator from going UP, but will not prevent something from using a tree to jump onto the house. The opening of the nestbox should be facing away away from prevailing winds to prevent rain from being blown into the box opening. In hotter climates, it is important that the entrance face away from the afternoon sun, if at all possible. If you have tree swallows in your area, you can pair two boxes from 5 to 25 feet apart which will allow both species to nest. Any other boxes should be placed 300 feet apart and preferably out of sight of other pairs.